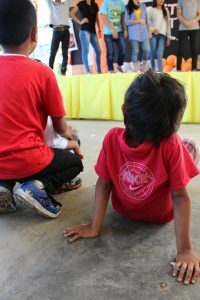 The Volunteer for the Visayans Child Sponsorship Program began life as a small project that aimed to provide social welfare services for a handful of disadvantaged children. One of the most frequently asked questions by people looking to sponsor a child is, “How does VFV select the children to be sponsored?” Since the number of impoverished families in the Philippines can be overwhelming at times, we identify the children based on an extensive assessment process that includes thorough interviews of the children and their parents, along with coordination with local officials. In addition, we choose communities that are strongly committed to working with us, as the support of the district (barangay) councils is vital for us to carry out our work. Currently all of our sponsored children reside in Leyte – in the Bliss neighborhood of Tacloban City, where our main office is based, in the areas surrounding our two rural Community Centers near the town of Palo and north of Tacloban near the city dumpsite, and also in Tanauan and Ormoc City. Our goal is to build our sponsor base so that we can serve even more communities in the future. Starting with a handful of children in 2004, more and more children were gradually added to the program. As of today, we have around 170 children enrolled in our program. We monitor the progress of the sponsored children very closely. This includes tracking their attendance and progress in school, their participation in VFV activities and meetings, their adjustment at home and in the community, and their health status. The children are required to attend school regularly and participate in our tutorials and other programs. If a child is having difficulty complying with these requirements, we do our best to work with the child and the family before removing the child from the program. We believe that correspondence is an important means for a child and sponsor to develop a positive relationship. For this reason, we work closely with the children to ensure that they write to their sponsors periodically and we try to update the sponsor with pictures as often as possible. We do our best to work with each sponsor on an individual basis as we understand that individuals may have special interests and differing expectations when they decide to sponsor a child. Our services include coordinating with individuals who wish to sponsor a special needs child, with those who are interested in working more closely with the sponsorship program, or with organizations who are interested in sponsoring groups of children. We always welcome constructive feedback as we want to continue to improve our program. VFV is keenly aware that there would be no sponsorship program without the continued involvement of sponsors, so we hope to work closely with our sponsors to benefit the future of our program. We feel very fortunate to have the support of so many caring and generous sponsors all over the globe, who have truly made a difference in the lives of our sponsored children.